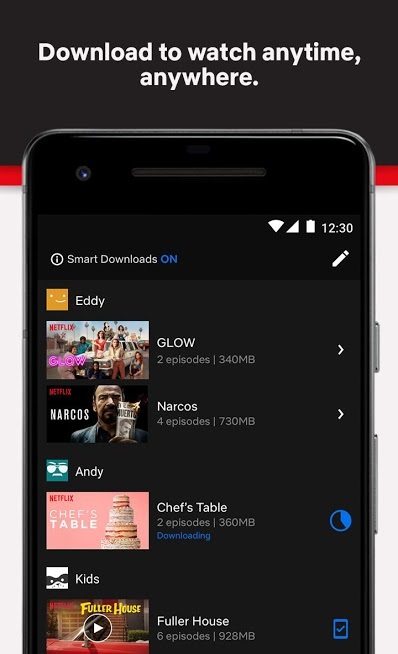 Netflix for Android is the world’s leading on-demand video streaming app. It is a subscription based online streaming service that can be used on multiple devices. The app allows to watch TV episodes and films seamlessly and gives you the best experience. You can stream content anywhere and at anytime. The membership gives you access to unlimited content with which you can enjoy and have great entertainment within your palms reach. Netflix prowess in the digital media is a proven fact that its content is superior and interesting to watch. Netflix, being the leader, has humongous content that can entertain you the way you want. You can browse, select and watch the growing selection of thousands of titles, and new episodes that are added regularly. It has an expanding list of devices on which you can watch any if its content. Search for titles and watch immediately on any of the supported devices. Netflix can help suggest the best titles as you rate your favorite programs and films. This will let the app know what you like and will present you with just that. The app is quite flexible that you start watching on one device, and resume watching on another. The website netflix.com can be accessed from TVs, game consoles, tablets, phones, Blu-ray players and set top boxes on which you can watch Netflix. The parental control is a great way to protect kids from content above their age level. List of top pick and viewers recommendations help you decide on what to watch. Subtitles can be added and the color, size and background can be customized. Netflix has over 70 million members spread across 190 countries and plays on variety of devices like Android, iOS, Windows, smart TV, apple TV, desktop, tablet, Play station and Xbox. Watch thousands of TV episodes and movies in any of these devices. The app is free to download with in-app purchases for various membership subscriptions. It has one month free trial after which you will have to purchase a membership for continuous use. Memberships can be cancelled anytime.